In a much horrific news that spread like wildfire, a pedestrian was killed by a self-driving car. This jolted the world of autonomous vehicles which was looking forward to bring about a disruptive change in the industry. As the news made headline, Uber suspended the trials and the government of US has since then been busy collecting information about the possible scenarios that resulted in the accident and questioning the operator behind the wheel in the autonomous car. This incident has raised several ethical and legal questions about self-driving cars esp. when governments and companies around the world are implementing laws and offering stimulating rebates respectively for bringing self-driving cars on road. However, a single incident cannot shut down the years of research and hard-work done to bring autonomous vehicles on road. In fact, this pilot trials were implemented based on advanced sensors, navigation and mapping before autonomous cars hit the roads. The technology is on-point and offers several advantages to take down the number of road accidents and traffic congestion. The technology behind self-driving cars are responsible for evading the possibilities of accidents and congestion but what if, the technology itself turns faulty and meet with accident and kill people. In such a scenario, when there is no driver in the vehicle, who will take the responsibility of accidents and murders? Can we hold the owner of Uber responsible or investigate the technology used for the same? May be, Blockchain has the answer. A Blockchain based framework can offer a platform to determine the liability in self-driving cars accidents. Read Also : Driverless Cars: Can We Trust Them? In a partially autonomous vehicle, human can still be blamed for having control over the vehicle. Depending on the kind of liability assigned to the drivers and machine, one can determine the cause of collision that whether it was technical or human error. However, in fully autonomous vehicle, no one can be held completely responsible as the responsibility is equally divided between service centers, manufacturers and the owner of the vehicle. If the crash resulted due to designing errors, manufacturers can be held liable while engineer can be charged for programming buggy software. Service centers are responsible for supplying adequate service to the machine and any negligence on their part ca result into collision. This framework demonstrates a simplified version of responsibilities. What if the negligence obligation falls to the shoulder of the owner, who fails to implement a software update from the manufacturer necessary for driving. Or what if manufacturer claims that the accident could have been prevented by a human driver. In this multifaceted web of potentially responsible parties, how can the conditions resulting in an accident be established? How Blockchain Can Help Make Liability Decisions? Autonomous vehicles are data-rich platforms as they are equipped with array of sensors on board responsible for monitoring, tracking and evaluating everything. Navigation sensors regulate directions while situational awareness sensors spot hindrances, follow lane marks and scan traffic signals. Meanwhile, performance measurement evaluates critical functions like oil levels and tyre pressure. Evidently, this data from vehicle sensors can be used as solutions to make liability decisions. With the help of virtual reality tech, accident scenes can be reconstructed virtually after retrieving and analyzing data from all sensors. But the reality is altogether different and more complicated. Because in the existing ecosystem, there is a risk of data alteration as some responsible parties have lopsided access to the sensor data. 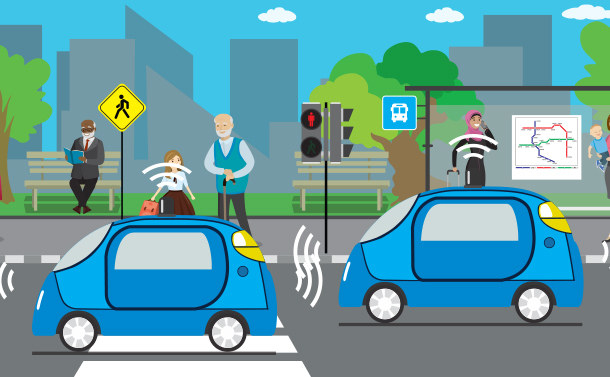 Eventually, one of the parties can modify the information to turn the liability decision in their favor via USB and wireless interfaces supported by vehicles. This will result in tampered recording of sensor data, giving false information about the interactions within the vehicle. Here, Blockchain technology can play a significant role to avoid tampering and deliver correct data for making liability decisions. with this technology, only relevant and registered parties can register and access information from sensors. In the first assembly, termed as “operational partition”, the participating members will be software providers, manufacturers, insurance companies and service centers while the second group includes legal authority and government transport authority, to be known as “decision partition”. The former group can record and share a ledger to all participants describing relevant sensor data about the accident while the latter will be responsible for taking liability decisions based on the data provided by former group. This structure will ensure that every individual vehicle owners remain unidentified to parties in the operational group and only decision party have the access to the identities of vehicle owner for making final liability decisions. This allow maintenance of user privacy and simultaneously offer translucent and unswerving liability decisions. Using Blockchain technology for establishing trust in autonomous vehicle is just the beginning. The same arrangement can be applied to smart homes, smart grids and supply chains. Since each of the field has sensor data installed, they can be stored in Blockchain and used later for claiming insurance, tracing the products and trade and distribute energy. This innovative idea is still under consideration but as autonomous vehicles are gaining importance and several lives are at stake, it is rather vital to make a move before things go out of hand. If you have anything to share, please comment in the section below.